The Citadel Council is the major executive commitee of the galaxy, which is why the unofficial term “Citadel space” is used for the species and planets who apply the Council law. Those who reject Council law can often be found in the Terminus Systems. Only 1% of the galaxy is in Council space. The other parts have not been discovered yet. The Citadel Council has the highest power. 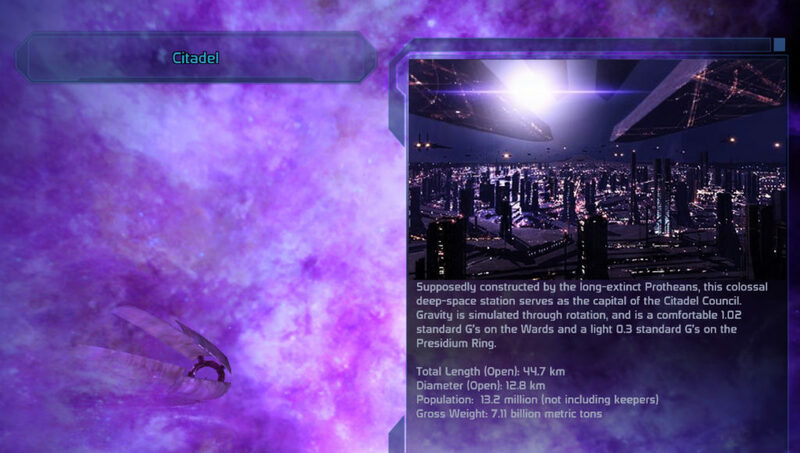 The Asari Republics: the asari were the first to find the Citadel and are the most experienced of the race. Their history and culture heavily influenced Citadel politics. On their homeworld, Thessia, there are different Republics. The asari as a whole make the law with their ” all-inclusive legislature”, but the The Matriarch, the oldest asari, are their leaders and the ones who have the last say. The Matriarch are also the ones who execute the law and judge those who don’t follow the law. The Justicar Order, made of Justicars, hunt down the biggest criminals in asari space. They’re feared among all asari. The Salarian Union: the salarians reached the Citadel second. On their homeworld, Sur’Kesh, matrilineal bloodlines and political alliances formed through interbreeding determine who lead. Each area is ruled by a Dalatrass. 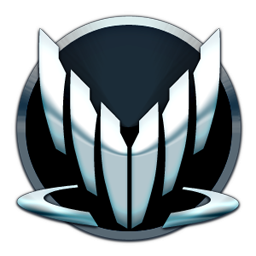 The salarians have the Special Tasks Group, a group of elite agents who specialize in counterterrorism, infiltration reconnaissance, assassination, and sabotage. In general it’s safe to say the most important families make the law, execute it and judge those who do not follow it. The Turian Hierarchy: the turians gained a seat on the Council following their role in ending the Krogan Rebellions. 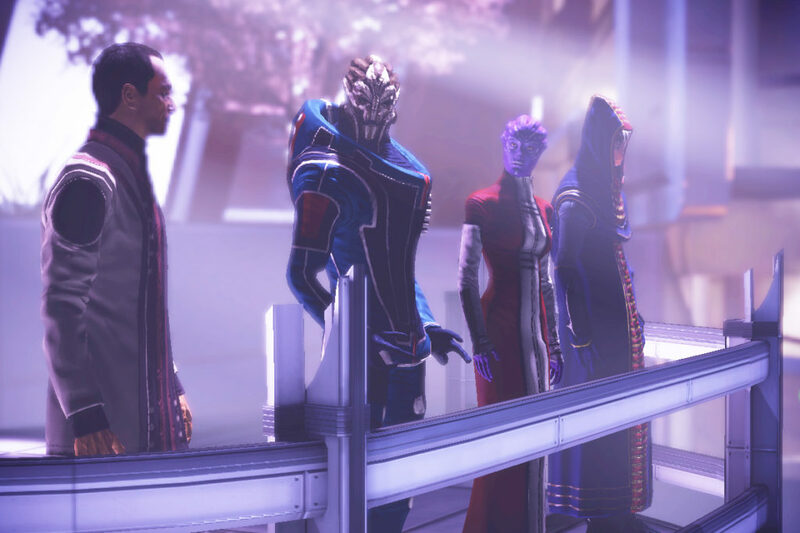 The turian government is ahierarchical meritocracy. The turians value civic duty and sense of responsability. They have 27 citizenship tiers: civilians, military service and formal citizenship are the major steps. When a turian ascends to the last tier, they have a chance to become Primarch. Each Primarch rules over a colonization cluster. The Primarchs are the ones who vote on matters regarding national importance. The Turian Hierarchy makes sure the law is executed. Turians at every tier are usually the ones who judge those who don’t follow the law, with rehabilitation being possible. The turians don’t have a task force like the salarians or a specific order like the Justicars. The Council’s decisions carry all over the galaxy, though they don’t have power over independent governments. The Council strives for for compromise, cooperation and peace. The asari are usually the diplomats, the salarians are the espions, and the turians are the soldiers. The Spectres (from the Office of Special Tactics and Reconnaissance) answer only to the Citadel Council. They’re elite operatives who have the power and authority to deal with threats all over the galaxy. How they deal with those threats depend on their personality: some Spectres try to keep the peace, others are assassins. The non-Council races are the hanar, volus, elcor, quarians, batarians, geth, drell, krogan, vorcha and keepers. Some of those races are granted an ambassady in the Citadel and some are client races (the volus are a client race of the turians and the drell are a client race of the hanar). We’ll add more information about the different species very soon.